Your campaign tracking is a mess. Or, at least it could be better. That cross platform integrated campaign is using different tags on email, social and AdWords, making it nearly impossible to track its performance in Google Analytics. We’ve all suffered when trying to figure out how to properly tag campaigns to produce useful reports. There is a learning curve. Tracking integrated campaigns means having an organized system for tagging and getting everyone (including ourselves) on the same page. This post provides tips for tagging consistency to better track your campaigns in Google Analytics. The ultimate goal is for us to be able to track which campaigns are most effectively bringing in customers. Let’s start by looking at some Google Analytics reports to understand what can go wrong and why it is important to organize our tagging. With correct tagging, these reports can be invaluable. With bad tagging, they become unusable. The Campaign Report (Acquisition > Campaigns) provides key metrics on campaign performance. The first column shows our list of campaigns. In the example below we see a mixture of AdWords (Search Standard – New Site) and Content Marketing (Sharing Google Analytics Reports). 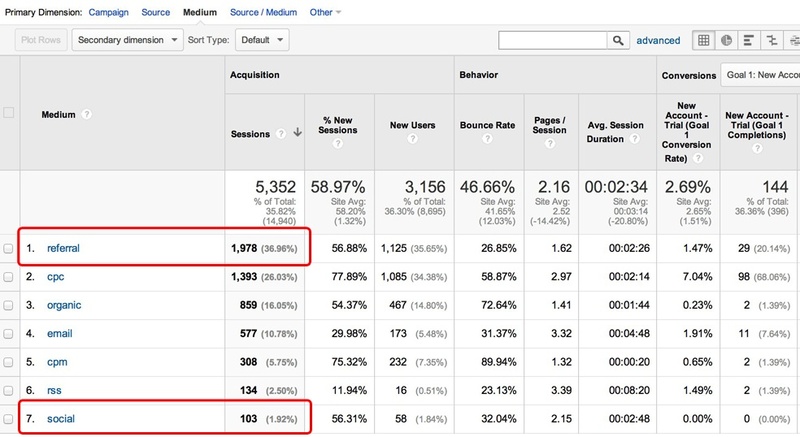 The other columns show different measures of engagement and conversion for site users arriving via the various campaigns. At the top of the report, there is a menu (circled in red) where you can select different dimensions for the first column. For example, rather than looking at this data via campaign, you may want to view it via Medium (e.g., cpc, email, social, etc.). Now, there are a few specific problems in the report, which resulted from tagging mistakes we made. One problem is that many of the items listed as “campaigns” are not campaigns but individual blog posts. 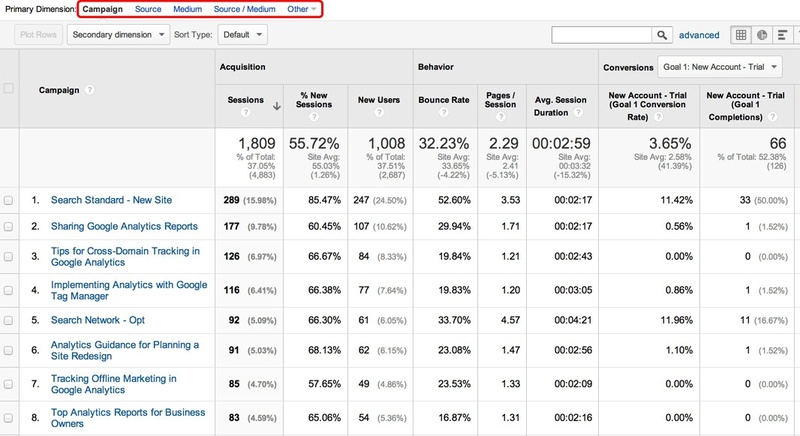 For example, “Sharing Google Analytics Reports,” and “Analytics Guidance for Planning a Site Redesign” are both blog posts you may remember reading here at Megalytic. These should be organized under a single “Blog Posts” campaign and we should have used another tag (the content tag) to differentiate them. I’ll get to that later in this post. You can see another problem if you select “Medium” as the primary dimension. The problem here was that we used the wrong medium tag on various posts. Unfortunately, Google Analytics does not provide a mechanism to “fix” your data. Once it goes in, it stays as-is. So, it pays to get the campaigns tagged correctly! The left-most column shows the campaign. The “(not set)” value indicates traffic that did not come from a campaign (e.g., organic search). The Assisted Conversions columns indicate how many visits from that campaign assisted in the conversion and the total dollar value of those conversions. An assisted conversion is one where a campaign was the source of a visit to your site, but not necessarily the visit where the conversion took place. For example, maybe a visitor first learned about your site from a campaign. Then, came back via an organic search, and didn’t convert until the third or fourth visit. In this case, the campaign gets credit for an assisted conversion. Again, because we tagged our blog posts as individual campaigns, this report cannot show the total number of assisted conversions that blogging has achieved. Google provides a good nuts and bolts description of how to implement campaign tagging. However, to use Campaign Tagging effectively, you have to know more than the technical mechanics of how to tag. You need to prepare a framework, or taxonomy to tag consistently. Using a tagging taxonomy will prevent the reporting problems described above. When creating tags for campaigns, we are working with up to five tags. Three of these are essential, and two are less important, but can be valuable for more detailed tracking. source (utm_source): The domain of the page where the campaign link is published – twitter.com, linkedin.com, plus.google.com, craigslist.com. medium (utm_medium): The type of communication medium used to delivery the campaign link - email, social, cpc, banner, display, referral. campaign (utm_campaign): The name of the campaign. content (utm_content): A sub-category of the campaign identifying the content used. For example, in AdWords this is used for the actual ad shown which resulted in the click. This could also be used to identify a particular blog post in a blogging campaign. term (utm_term): Usually reserved to store keywords from paid search. A campaign tagging taxonomy provides a set of rules that determine what data is used for each of these tags when you create a custom campaign. It is important that everyone in the marketing organization understand this taxonomy, so that when multiple people are involved in creating campaigns, you end up with consistent results. We’ve already discussed the mishaps that can occur when social campaigns are tagged incorrectly. Here are some guidelines that you can use to create your taxonomy. 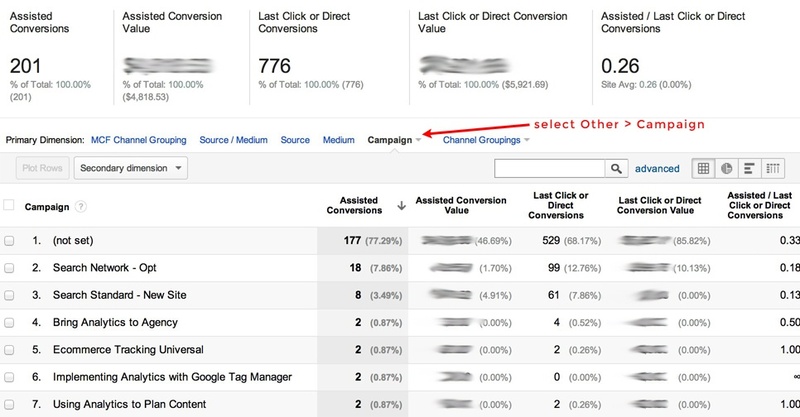 For a deeper dive, I highly recommend The Definitive Guide To Campaign Tagging in Google Analytics by Annie Cushing. Always use the domain of the site where the link to the campaign content has been published. If you post a link on Twitter, use “twitter.com.” For LinkedIn, use “linkedin.com,” etc. The medium should be a large category describing the type of communication media used – like “social” for social media. Do not use individual social media services like “facebook,” “linkedin,” “twitter.” Since the source tag differentiates the individual services, you don’t need to be fine-grained here. In fact, the goal is to use medium to define broad categories. This allows you to aggregate information across campaigns and see the performance for a particular type of traffic. When possible, I like to use medium tags that are consistent with the ones used by Google Analytics for default classification: referral, social, and cpc. Additional medium tags that you might use are: email, display (for display advertising), affiliate (for affiliate marketing). Here, you should choose names that work across multiple mediums and sources. “July Email Newsletter” is not a great name if you post the newsletter on your website and people read it there, as well as via email. In that case, “July Newsletter” would be better. The “email” information goes in the medium tag. Even better, just use “Newsletter” and put the “July” information in the content tag described below. “Spring Shoe Sale” is a good campaign name for a promotion that would be broadcast via web, social media, and email. Use easily recognizable campaign names. “Weekly Specials” is better than “WSP-2014-07-29,” and will make reports easier to read. If you need additional detail coded into your campaign, use the content parameter. In AdWords, this tag is used to distinguish between different ads in the same campaign. A good practice is to follow Google’s lead and use this tag to differentiate variations within a campaign. For example if you publish a daily “Tip of the Day,” you can use that for the campaign name, and each day update the content tag to the date: “2014-07-29.” That way, you can track overall performance of the “Tip of the Day” campaign, but also drill down and see individual days using the content tag. term (utm_term): In AdWords, this tag is used to store keywords (queries) used in the search that triggered the ad. If you use other paid search services (e.g., Bing), you need to do some manual setup to ensure that keywords end up in here. I don’t recommend using the term tag for anything other than search keywords. To track AdWords campaigns, you should link your Google Analytics and Adwords accounts and turn on auto-tagging. While you can manually tag AdWords campaigns, it is a lot of work and highly error-prone. Tools like MailChimp and Buffer offer built-in features that seemingly make it easy to tag your campaigns. But, often when using such tool features, it is difficult to enforce your taxonomy. 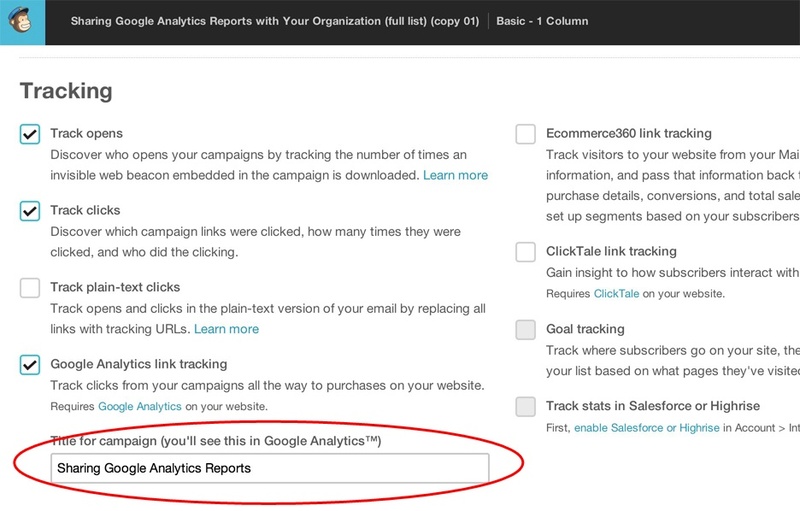 For example, MailChimp can automate Google Analytics link tracking. If you check the box to activate this feature, it lets you enter a value for the Campaign Name (campaign tag). However, your email campaigns show up with a random prefix in Google Analytics. MailChimp must do this in order to guarantee unique tags, but the result in your reports is a mess. To work around this, we recommend manually tagging your MailChimp campaigns according to your taxonomy. You can accomplish this by simply using your desired tags in the links that you place inside your HTML emails. And don’t forget to turn off the Google Analytics auto-tagging in the administration section of your MailChimp campaign. We’ve all suffered the effects of poor tracking, especially as campaigns become more integrated and more complicated than before. But we don’t have to sink in our bad data. By creating a tagging taxonomy and working to get our team on the same page, we can increase our ability to properly tag campaigns and collect the insights we need about our customers.